HARTFORD - No. 3 UConn let conference co-leader UCF know very early that it is not really in the same league. “We wanted to put them away early, get on that big run and let them know that this is our game,” Walker said. The Huskies have won all 108 games they have played against AAC competition, 93 straight in the regular season. They are now 9-0 all-time against the Knights. UConn jumped out to an 8-0 lead less than 90 seconds into the game. It was 17-2 three minutes later and 29-14 at the end of the first quarter. Crystal Dangerfield’s driving 3-point play gave the Huskies their first 30-point lead at 50-20, and her layup at the halftime buzzer made it 61-36. Kayla Thigpen had 14 points to lead UCF (17-3, 6-1), which had its seven-game winning streak snapped. Nyala Shuler and Sianni Martin each added 13. UCF coach Katie Abrahamson-Henderson said her team came into the game hoping to limit Samuelson’s 3-point opportunities. UConn’s star finished just 2 of 9 from behind the arc. But the Huskies dominated in transition, outscoring the Knights 27-6 on the fast break and 38-18 in the paint. Collier finished with nine rebounds and needs just two boards and 37 more points to become the fifth UConn player with 2,000 points and 1,000 rebounds. UCF: The Knights came into the game forcing an average of just over 20 turnovers per game and stealing the ball just under 11 times. 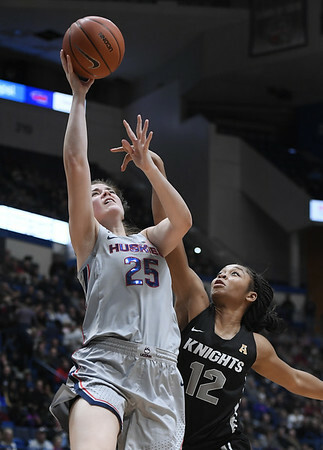 They were able to turn the Huskies over 14 times with eight steals, but had 19 turnovers of their own, leading to 24 UConn points. UConn: The Huskies are beating AAC opponents by an average of 35 points and during their conference winning streak, and have had just one game in single digits, a 63-60 win over Tulane in February 2017. Walker had 11 rebounds, putting up her second double-double of the season. It was the sophomore’s fifth straight game in double figures. Auriemma said he was especially pleased that he had to take her out of the game at one point because she was exhausted. He said Walker never gave that kind of effort as a freshman, when she averaged just 5.8 points. Dangerfield had nine assists, five rebounds, two steals and a blocked shot to go with her 17 points. Auriemma said it was probably the most complete game she has played at UConn. UCF: The Golden Knights head home for two games. The face Houston on Wednesday night and rival South Florida next Sunday. UConn: The Huskies travel to Louisville for a showdown with the No. 4-ranked Cardinals on Thursday night and then play at Cincinnati on Saturday. Posted in Newington Town Crier, UConn on Sunday, 27 January 2019 21:15. Updated: Sunday, 27 January 2019 21:18.